How many times have we all wished that Facebook had a ‘Dislike’ button? When someone posts a status update about their dog dying, the person not feeling well or something else bad happening in their life, why can we only click ‘Like’? Emerging media are measured in many different ways, one of which is irritation. Irritation measures how annoying, confusing, messy or deceptive a website is for consumers. It is known to mostly influence attitude toward the web, but also influences how entertaining, informative, and satisfactory consumers find a website to be. If a website is considered to be annoying, consumers are probably less likely to be informed or entertained by it. If consumers feel irritated by a website, a Dislike button would probably be requested for that website too. Measures of Behavior, Usage and Gratification have been proposed as a way to measure the effectiveness of interactive marketing communications. These types of scales examine how arousing, absorbing, enjoyable and entertaining consumers find their online experience. Social media sites are a type of website that consumers use as a form of entertainment. Facebook does allow a user to comment on a post, which in a scenario such as any of the ones listed above, it’s probably more appropriate to post a comment with your empathy or sorrow. But there is not an option to ‘Dislike’ anything on Facebook, Twitter or any of the other social media sites. You want to use that button for the occasional upsetting moments, but there are also those people that just gripe about everything under the sun…you know…Haters, those people that get up each morning and drink their Haterade. Well, guess what? They now have a new social media app called ‘Hater‘. The app was revealed this past Friday at the South by Southwest (SXSW) technology event. The creator of Hater, Jake Banks, believes the language of “likes” used on other services such as Facebook forces us to be overly positive and restricts our ability to be ourselves. That’s why he decided to develop an alternative social networking app called Hater, which is intended for sharing all the things you don’t like. The app looks a lot like Instagram. It allows you to take a picture or upload a photo from your phone, share it to the Hater community with a caption, view a feed of other posts from the Hater community and offer feedback. Banks says Hater doesn’t just want people to be negative for the sake of being negative. He plans to roll out a feature in the future called Hate For Good, which will let users “create awareness” for things that need changing simply by sharing the fact that they dislike it. How many people hate politics, traffic jams, duck faces? Perhaps you can try to change those things, but let’s be honest…I don’t think anyone is going to change Kim Kardashian from doing her duck face. 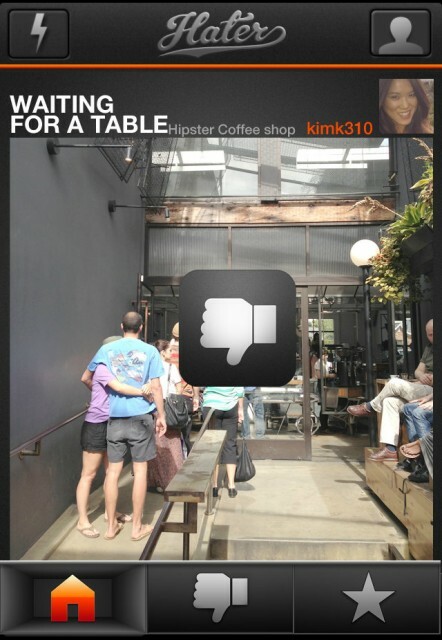 The app could have potential for creating awareness of businesses that have treated customers badly or perhaps for products that are bad, but overall, I think the idea of the app will only encourage an already very negative culture. Can’t Mark Zuckerburg just create a ‘Dislike’ button? Is that too much to ask? This entry was posted in Emerging Media and tagged app, dislike, hate, social media, SXSW by Crystal. Bookmark the permalink. I agree that this new app might just encourage negativity. Since users have the ability to post pictures and videos, an app like this could even lead to increased bullying. Sharing things you dislike seems to create more emotion than sharing things you do like. I don’t know what it is about apps like this, but they seem to bring about an increase in malicious posts. This actually reminds me of the PostSecret app, which had to be discontinued because of malicious posts (http://mashable.com/2012/01/02/postsecret-app-discontinued-because-of-malicious-posts/). A ‘dislike’ button on Facebook seems to be a much easier/better idea. Maybe on the next update we will finally see that. The Like button is a lazy way to engage (I admit, I use it all the time) – but at least it’s positive. “If you can’t say anything nice, don’t say anything at all,” doesn’t always apply, but people who are unhappy with a brand should spell out why, so there’s an opportunity to fix the problem. As far as personal relationships go, a dislike button certainly opens the door to increased opportunities for bullying – and imagine how it would play out in a breakup. You bring up an interesting point about bullying. I could see the Hater app definitely playing a big part of that. When comparing the Hater app to a Dislike button, I feel like the Dislike is a little softer than hating something. This is definitely something that I’m sure Facebook has considered and plays a role in why there is not a Dislike button out there. This is a negative concept, but kind of funny. I have never thought of the idea of a “dislike” button but I have always wished that there was a “LOVE IT!” Button! Sometimes like is not enough.